Students and teachers today swim in a world of technology. Computers live in their pockets, information and media are ubiquitous commodities, and apps aid many of their daily routines. Yet even with all this tech, teachers continue to struggle with the workload on their shoulders. And to make matters worse, technology often adds one more thing that they have to manage. To help schools and districts think more strategically about technology’s impact on educator capacity, I’m working on a framework for distinguishing various ways ed tech complements teachers. I find that when technologies are implemented well, they amplify educators’ capacity in one of three ways: 1) they enhance teachers’ effectiveness, 2) they accelerate how teachers get tasks done, or 3) they enable teachers to take new approaches that were impossible or impractical in the past. Yet while each type of amplification has value, the biggest opportunities come from the third type: enabling teachers to spend more time, energy, and expertise doing things technology can’t do. Software is great for generating immediate, automated feedback on students’ mastery of basic knowledge and skills. But higher-order feedback falls outside its purview. Consider, for example, essay grading. For years, word processors have been able to point out corrections for spelling and grammar errors; more recently, intelligent software offers feedback on elements of structure and style, such as whether each paragraph has a topic sentence at the beginning and contains evidence related to that topic sentence and the essay’s thesis. But software cannot give feedback on many of the qualities that define great writing, such as whether the students’ rhetoric and logic will resonate with their intended audience. It takes a human to give feedback on the more nuanced aspects of human communication. The same holds true for higher-order learning in other academic domains. Software can potentially access a lot of data about a student: home address, race and ethnicity, diagnosed learning disabilities, family income, attendance records, test scores, browser history, even keystrokes and mouse clicks. But with all that data, can software really know a student? Can a computer understand how his social status at school leads him to feel when he’s assigned to work with a particular group of peers on a class project? Or can it predict that she’ll enjoy reading a particular novel because it reminds her of her best friend from the town where she used to live? Software can make a lot of useful inferences based on patterns it finds in the data it collects. But it can’t gather data on all the important factors that shape a student’s learning experiences, nor can it model all the psychological complexity of childhood and adolescence. Real knowing and understanding is a human-to-human experience. Where do students get the motivation to learn? At times, motivation may come from pure intellectual curiosity. But more often than not, it comes from relationships. For example, a student stays after class for extra tutoring because he cares what his parents think of his grades and he believes in his teacher’s confidence that a little extra practice will help him get the grades he wants. Or a student becomes excited about science because a teacher who cares deeply about her also cares deeply about science. Students often work to learn and to achieve for the praise of people who matter in their lives. Software, for all its wondrous abilities, can’t offer that sense of genuine caring. Teachers remain a performance-defining feature of even the most technologically sophisticated learning environments. That’s why now, more than ever, teachers should be given the critical support they’re asking for in the classroom. But here’s the rub: While software can’t do the things listed above, neither can most teachers. For teachers, however, it isn’t a matter of capability, but of capacity. How often do English teachers confer individually with students about the quality of their rhetoric, especially when correcting grammar and structure already takes up so much time? How many teachers have time to meet regularly with each student just to ask about how they’re doing, let alone attend all their students’ extracurricular activities or visit their homes to get to know their families? Caring about students isn’t constrained by time, but showing that you care is. Unfortunately, most teachers’ days quickly fill up with planning lessons, writing quizzes, running copies, covering content, attending staff meetings, and grading lower-order assignments, with little time left for many of the high-value activities described above. This is why ed tech is so important for teachers, in spite of all the things it can’t do. If we want all students to thrive in an increasingly complex world, we need teachers to spend more time developing students’ higher-order skills, tailoring learning to their personal circumstances, and building strong relationships with them. 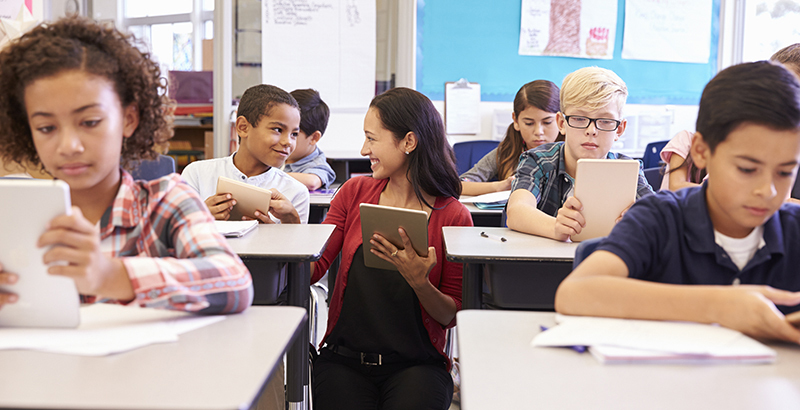 A key way to unlocking teachers’ capacity comes from using technology to do some of their work so they can focus on the important tasks technology can’t do.